(Rubank Solo Collection). This top-rated collection of solo literature from the celebrated Rubank catalog is known by teachers and students everywhere. Each edition offers a superb variety of solos customized for that instrument. 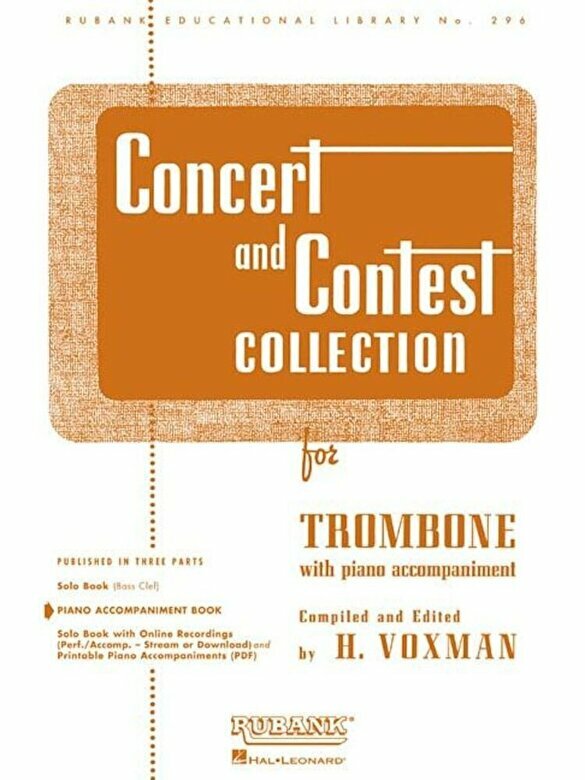 Most state solo/ensemble contest lists include several solos from this collection. Also available: * Solo Book (HL04471790) * Solo Book with Online Media (Performance/Accompaniment Recordings (stream or download) and Printable Piano Accompaniments) (HL04002522) Contents: Allegro Vivace from Concerto for Trombone (Rimsky-Korsakov) * Apres un Reve (After a Dream) (Faure) * Canzonetta (Mozart) * Concerto in F Minor (Lauga) * Concerto Miniature (Ostransky) * Crepuscule (Twilight) (Faure) * Love Thoughts (Pryor) * Morceau de Concours (Missa) * Prelude and Fanfaronade (Koepke) * Sarabande and Vivace (Handel) * Solo de Concert (Dubois) * Theme de Concours (Clerisse) * Two Spanish Dances (Ostransky) * Valse Sentimentale (Tchaikovsky).